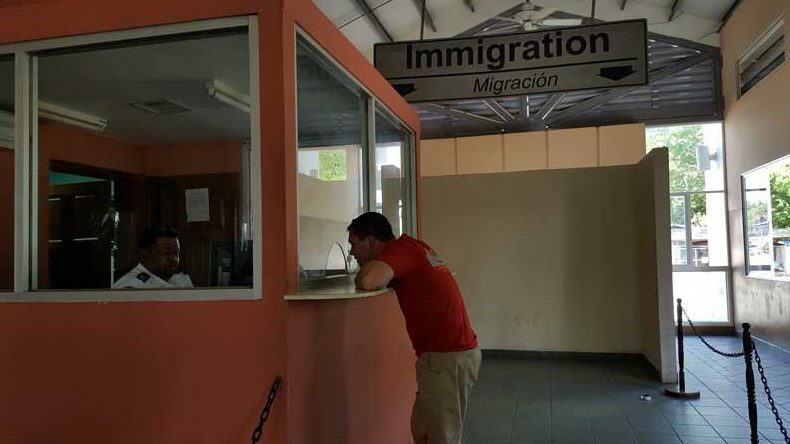 Border crossings can be a bit confusing, especially when it comes to Central America. Unlike in the European Union, crossing into another country in the Americas is a process… sometimes a lengthy one. But that didn’t stop us from renting a car in Belize and making the trek into Guatemala. 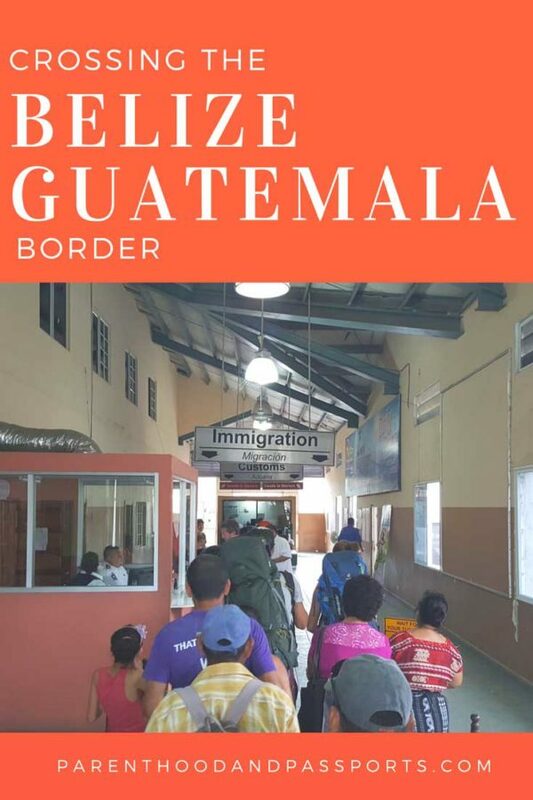 Prior to crossing the Belize/Guatemala border, I scoured the internet looking for information about the process, requirements, laws, and safety in the country. Let’s first address the safety issue because much of what I read online said not to cross into Guatemala unless on a guided tour because you would get run off the road and robbed by machete-wielding bandits. Of course, every report of this type of violent, frightening occurrence was 5-10 years old. In fact, I couldn’t find any recent information or statistics on tourists becoming victims of a crime in eastern Guatemala, which leads me to believe there haven’t been any major incidents. In our experience, we never felt anything other than completely safe in Guatemala. The roads are well maintained, the border agents and all the other people we encountered at the border were friendly. Even the intimidating, machine gun-carrying military men were nice enough. 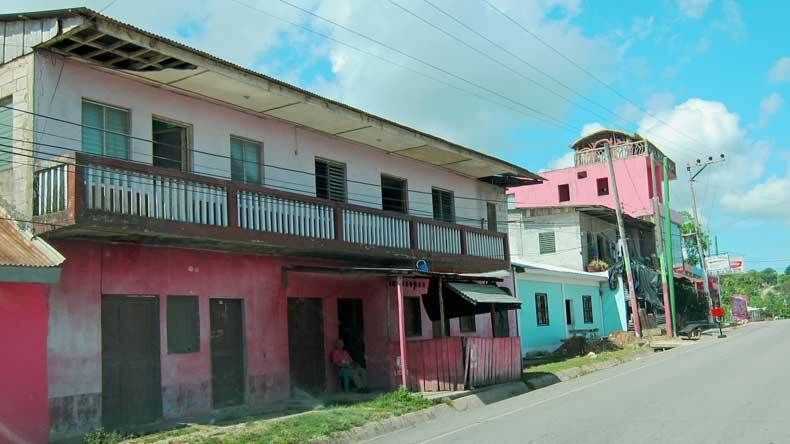 This is a rural, sparsely populated area of Guatemala. You aren’t going to cross through big cities with gangs and cartels. This area of Guatemala probably has a lower crime rate than your own hometown. With that said, not all parts of Guatemala are safe. For example, I wouldn’t recommend driving around Guatemala City at night, just as I wouldn’t recommend driving around parts of New Orleans, Detroit, or Los Angeles at night. Safety can be an issue in just about any country. But if you are considering crossing the Belize/Guatemala border to visit Tikal, or the city of Flores, I don’t think you will be putting yourself in danger by doing so. If I had the least bit of concern for our safety, I would not have taken our beautiful, innocent toddler across the border. I am a way more cautious traveler now that I am a parent. If you need more convincing, check out the blog Claire’s Footsteps. She has an excellent write up on staying safe while traveling in Guatemala. So with that settled, let’s discuss the ins and outs of driving across the Belize/Guatemala border. 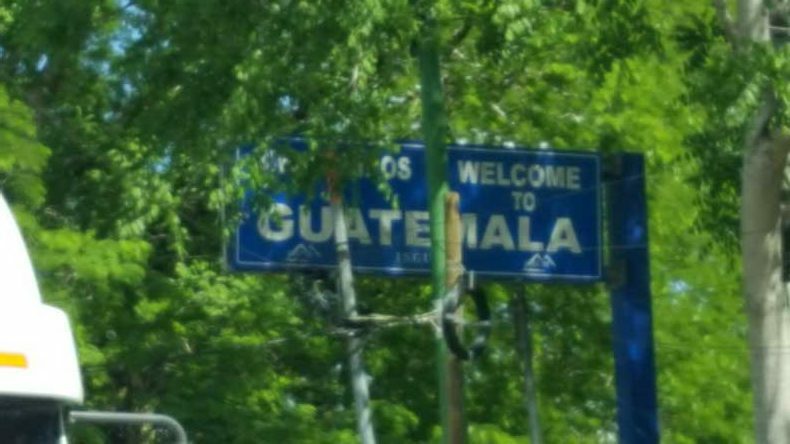 As I mentioned earlier, crossing into Guatemala from Belize is a process, and it’s one that starts before you ever reach the border. It’s important to note that most rental car agencies in Belize do not allow you to take their vehicles across the Guatemala border. The exception is Crystal. This is the agency we used, and I found them extremely helpful. 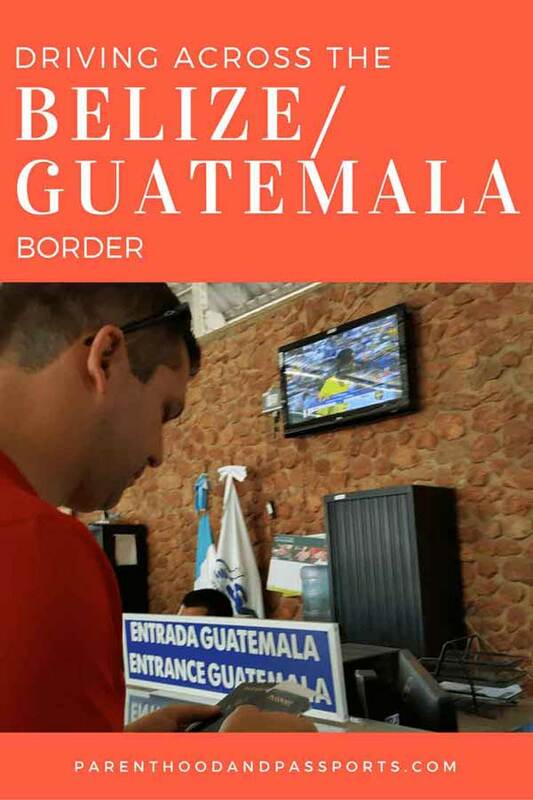 There is a $25 US fee if you are going to cross the Guatemala border because they have to fill out a bit more paperwork that you will surrender at the border. You can reserve your car and pay online and indicate in advance that you will take the car into Guatemala. They call it a Tikal permit, since most visitors crossing into eastern Guatemala are heading to Tikal. You may also want to read our advice for driving in Belize. Let me say, the reason most companies don’t allow cars across the Guatemala border is not because of safety. It is because Guatemala does not require or recognize car insurance, so in the event you are in an accident you would be responsible for the full cost of repairs. That’s a liability many companies just don’t want to chance. First stop when crossing the border from Belize to Guatemala. You’re first stop when arriving at the border will be immigration. You can’t miss it. It’s a well-marked building on your left. Parking is located on your right. Park the car, and go inside the building. Walk up to the counter in the center of the building, where they’ll ask you a couple of questions. 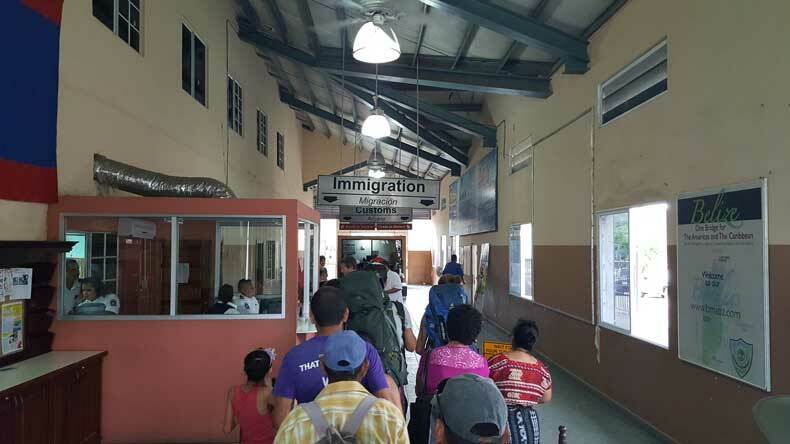 The representatives speak both English and Spanish on the Belizean side, so it’s a painless process. They will review your passports and hand them back. Here, you will pay your exit fee. As of 2016, the exit fee was $18.50 US per person. They accept either Belize or US dollars. The exchange rate is 2:1. Two Belize dollars equals one US dollar, so the math is easy. Proceed to the small window in the back of the building to get your passport stamped. Getting exit stamps in our passports at the Belize border before crossing into Guatemala. Outside the building, you will also find money changers. These are men who can exchange your currency. We exchanged $100 US dollars for Guatemalan quetzales. The rate is basically 7:1. Seven quetzales equals one US dollar. Of course, you may not get that exact rate from all the money changers, but they did give us a decent exchange rate that we were happy with. I’ve heard you can haggle with the men to get a better rate, but I wasn’t going to haggle over a matter of a few dollars, so we accepted the rate they gave us and moved on. You will also find money exchangers on the other side of the Guatemala border. So you can exchange your money in either place. After you’ve gotten your exit stamps and paid the fees on the Belize side, you are ready to drive into Guatemala. Your next stop in the process is fumigation of the car. You’ll drive your car through what looks like a giant car wash where they will spray insecticide on it. On the other side of the drive-through stall, you’ll see a small building with a walk-up window. Building at Guatemala border where you will pay your fumigation fee. Park your car, go to the window and pay the fumigation fee. This is easy to miss, but don’t! The charge is minimal… about $2.50 US dollars. They’ll give you a receipt that you will need to present later in the process. After you’ve paid your fumigation fee, leave your car parked and walk across to the immigration building. It is a large, open-air pavilion across the makeshift street from the small fumigation building. The first line you will stand in will say Entrada or Entrance. Here they will stamp your passport and give you a small piece of paper that you MUST keep and present when exiting the country. I’ve heard there is an “unofficial” entrance charge of 20 quetzales (roughly $2.60) to cross the Belize/Guatemala border, but we didn’t have to pay this. Maybe the immigration agents were in a good mood that day. Be prepared to pay it just in case. The next step is probably the longest one. After getting your entrance stamp, head directly to your left to turn in your rental car paperwork that the rental car company gave you. They will check the paperwork and passports, walk over to the vehicle to inspect it and check that the VIN number matches, then you will need to pay for a vehicle import permit. They will keep a copy of the paperwork. (The rental car company should have given your two copies, an original and a photocopy.) The vehicle permit costs approximately $21 US dollars or 160 quetzales. You will pay this at a separate window that is on the westernmost wall in the pavilion. After you pay your fee, you take the receipt back once again to the counter where you turned in your paperwork, and the agent will hand you a permit. You will likely have to show this at a military checkpoint down the road, so hold onto it or better yet, affix it to the inside of your window. Congratulations! You can now officially leave no man’s land and enter Guatemala in your rental car! The process to cross the Belize/Guatemala border took us approximately 45 minutes. However, there were hardly any lines while we were there. After you’ve gotten back into your car, there is a large bridge you cross to officially arrive in Guatemala. At the end of the bridge there are military guards who might stop you. They do not stop every car, but if you do happen to get stopped, they will likely ask for your permit then tell you there is a charge of anywhere between 20-50 quetzales ($2.60-$5.00 US) to pass. I’ve heard this is yet another big scam that most people just obligingly pay. To bypass the military men, right before the bridge, make a right turn and then an immediate left. There is a small dirt road that runs adjacent to the bridge. There are little tiendas or outdoor shops along the narrow road. If you take that road instead, it immediately joins up with the highway after the tourist bridge and you will bypass the checkpoint all together. You can see this in the video below. There might be another military checkpoint later down the road where they did stop us and check our permit. They did not try to charge us to pass at that checkpoint. Here is a complete video guide to the process. You can also view it on our Youtube channel if you prefer. Spanish is the official and primary language spoken in Guatemala. As English speakers, who only know survival Spanish, the language barrier added another layer of difficulty for us when crossing the Belize/Guatemala border. If you do not feel comfortable trying to communicate in broken Spanish, there are children who speak English very well at the Guatemalan border. They will likely be the first people to greet you after you drive through the fumigation stall. They work for tips and can translate everything for you and guide you through the process. We tipped them $5US. Working with the kids probably saved us about 15 minutes, because the clerk at the window where we paid for our permit allowed us to cut in line when they saw the children helping us. Do you need them? Probably not, but it was useful. I couldn’t help but feel bad for the kids. I hate to see 9-14 year old children forced to work to help feed their families. It just shouldn’t be that way, but that an issue I’ll save for another day. Exiting Guatemala and driving back into Belize is a much easier process. Even if you don’t speak Spanish, you’ll be able to communicate just fine without assistance. 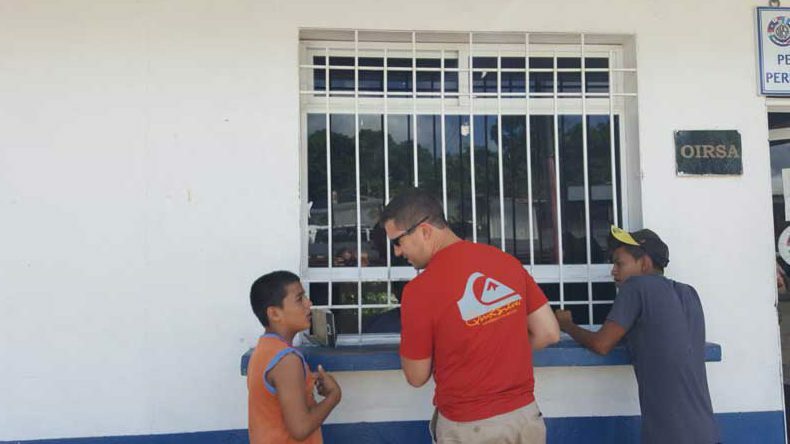 The re-entry process is not near as complicated as crossing the Guatemala border from Belize. When you arrive back at the border, go to the line that says Salida or Exit, hand them your passports and your little piece of paper they gave you when you entered. You will then get your car sprayed down again. This costs $20 Belizean dollars or $10 US. You will pay that fee at the stall. You then walk into the opposite side of the Belize immigration building and proceed through customs. It’s fairly easy. There is a short form you fill out at the window. If you are not declaring anything that was purchased, they stamp your passports and you can carry on. You’ll drive your car one more time officially crossing back into Belize. A border patrol agent will stop you, ask you a couple of questions, check your passports and wave you through. Welcome back to Belize! 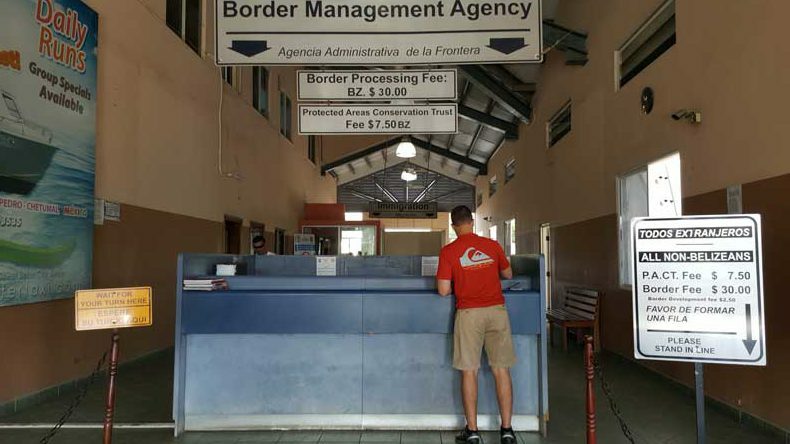 Have a question or comment about the Belize/Guatemala border crossing? We’d love to hear from you. Let us know your thoughts in the comments below. excellent post! The videos will help a lot of people too. Our next trip down to Guate will be through Belize so I am very grateful you posted this! Thank you! Before our trip I read a lot about what to expect, but once we got there, we still didn’t know exactly what to do. So I made sure to take pictures and and videos in hopes of helping others. I also wanted to address the safety issue since I read so many scary articles or blogs about hijacking risks that quite frankly were just out-of-date information being rehashed over and over again. Your detailed instructions about crossing the border are immensely helpful. I have included them in my packet of itinerary information for use in a few months when we will be visiting the area. Thanks so much! Glad we could help! Make sure you watch the video too if you haven’t yet. It might help give a visual of the process. Especially the bridge crossing at the end. Now that we have made the trip, another “thank you” is due for such helpful instructions about crossing the border. The one mistake we might have made is that we used the official bridge monitored by the security people when returning from Guatamela to Belize. We were charged the fee they would have charged us in the first place if we had used that bridge when going from Belize to Guatemala. Even so, we aren’t sure the little side street beside the bridge would have been navigable in that reverse direction at the time, so we might not have had that choice. There were no children at the crossing to help us cross the border perhaps because it was a school day. Instead, the clerk who had the responsibility to validate the rental car enlisted the help of a young man in his late teens or early twenties to serve that purpose. 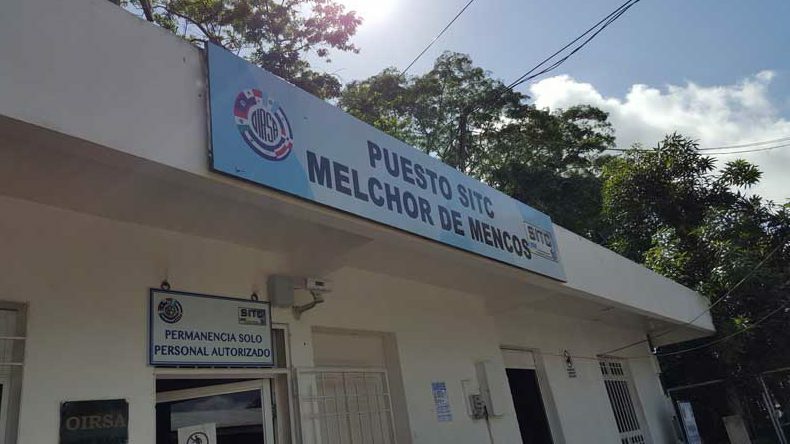 It’s amazing that the Guatemalan government doesn’t have English-speaking clerks at the border considering that English is the official language of Belize on the other side of the border. That policy makes me wonder if they are trying to guarantee income for the young “guides” who do speak English. I’m so glad you made the trip and found our post helpful! I am also amazed by the lack of English-speaking border agents in Guatemala. At the Mexico/US border the agents are bilingual. You would think the same would apply to all multi-lingual border crossings. I agree it may be a way to guarantee income for the young people who offer assistance to English-speaking travelers. We actually lucked out when coming back across the tourist bridge. The security agents didn’t charge us, so I wasn’t aware they collected “fees” in each direction. Thanks for the extra info for readers! We crossed at the town of Melchor de Mencos, Guatemala. I think this is the only land crossing between the two countries. Thank you! We will be crossing over to Tikal but will return to Los Angeles via Guatemala, City. Wondering about the car rental. Are there car rental place at Melchor Mencos both to leave the Car in Belize then rent another car to get to Tikal then to Guatemala City? That’s a tough one. Melchor Mencos is a small town. I don’t know that you will find a car rental place there. A bus might be the easier option. You can take a bus to Flores, and then another to Tikal. Then take the bus all the way to Guatemala City. We drove through this border crossing in the beginning of April, 2019. These instructions were very helpful. However, one major thing has changed. Now you are no longer able to pay for the vehicle permit at the border. Instead, you have to pay for it at a Banrural Bank about three quarters of a mile away. A taxi driver approached me and offered to drive me to the bank and back for 5 USD. At first I thought it was some sort of scam, but the border agent confirmed this, as well as a woman who worked for the Guatemala tourism office who spoke English. I ended up taking the taxi to the bank to pay this fee while my wife stayed by the car. It was about a 20 minute wait in line at the bank; I presented the teller the vehicle permit form I received at the border, paid the fee, and he stamped something on it and sent me on my way. 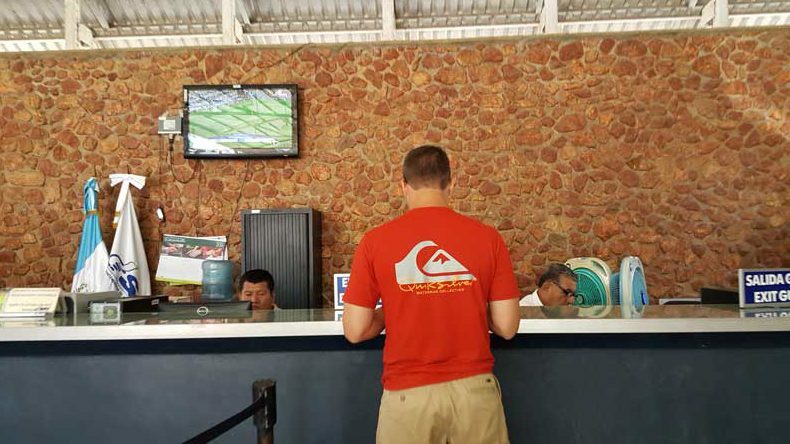 The woman who worked for the tourism office later told my wife that this new arrangement has been a problem, because it is impossible to pay for a vehicle permit when the bank is closed. She said it opens at 10am; anyone who wants to bring a car across the border earlier than that would have to wait until that time to purchase the permit. Wow! What a hassle. Thanks for the updated information. I wonder why they changed the process. This could drastically limit the number of people driving across the border now.